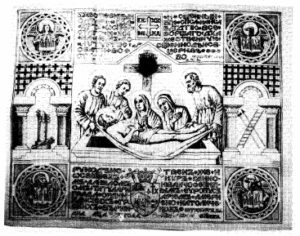 Antimensia are a cloth with a relic embedded blessed by a bishop on which the Divine Liturgy is conducted in Byzantine tradition churches. These at once provide the relic for the celebration and a living liturgical connection with the reigning bishop for the church in the area. Here I provide a copy of the booklet published by the Passaic Eparchy “Byzantine-Ruthenian Antimensia in the Episcopal and Heritage Institute Libraries of the Byzantine Catholic Diocese of Passaic” compiled by Right Reverend Mitred Archimandrite Januarius M. Izzo. I offer this in multiple formats. This presents the booklet in page number order with bookmarks set for each of the major sections called out in the table of contents. This presents the booklet in the original scan order that can be then printed out double-sided to create a new printed book using standard letter size paper. Here I have converted the images and text into web pages for easy viewing on-line. Due to encoding issues I do not have the latin alphabet transcriptions of the texts from the booklet on the web page version. 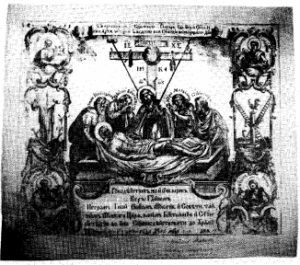 If I were asked to name the one artifact that is the clear and unique expression of the liturgical ethos and genius of the Churches of the Byzantine Rite, I could not find a much better example than the antimensium (antimension). Developed by the liturgists of that rite, it has been used almost exclusively bÑ the Churches of the Byzantine or Greek Rite until modern times. 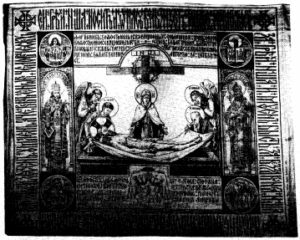 The antimensium (called “antimins” by the Slavs), as the etymology of its name suggests (“anti” is Greek for “instead of,” and “mension” a Greek neologism derived from the Latin technical term for the altar table, “mensa”), is a substitute for a fixed consecrated altar; in short, it is a portable altar. In modern form it is a piece of linen or silk about 18 inches square. Printed on the square is a representation, or icon, of the Deposition from the Cross or the Entombment of Christ. A small pouch containing Relics of a Martyr Saint is sewn to the other side. Portable altars were not unknown in the early Christian East or West. They were used, for instance, when a church was destroyed by some calamity, or when important personages or the military were on a journey accompanied by their chaplains. However, these portable altars took the form of fairly clumsy tablets of stone (the “petra sacra” of the West) or of wood (in the East). The antimensium was born out of necessity in the turmoil of the Iconoclastic struggles of the VIII and IX centuries. 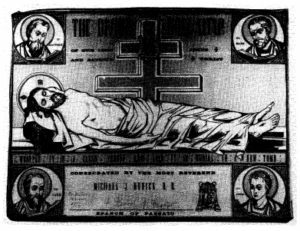 The Iconoclasts, or “smashers of images,” wrongly felt that the prohibition against images (icons) found in the Old Testament was valid also for the New Testament. This heresy had few adherents among the faithful, but the emperors of Byzantium seized upon it as a pretext to take over the monas-teries and plunder the churches. 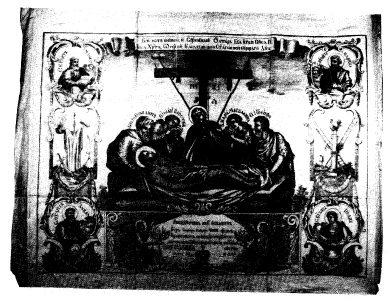 In the eastern portion of the Roman Empire, thÎ Iconoclasts destroyed a great many icons and disposed of the Relics of the Saints, the bodies or portions of the bodies of Saints which had been enshrined in churches and connected from the incep-tion of Christianity with the celebration of the Holy Mysteries. If any church has been consecrated without the Sacred Relics of Martyrs, Relics are to be deposited therein with the cus-tomary prayers. A bishop who henceforward consecrates a church without Holy Relics is to be deposed as a transgressor of ecclesiastical tradition. 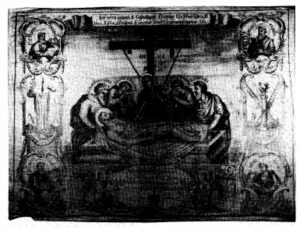 In this way it came about that a square or oblong cloth was substituted for a rigid and heavy wooden plank. On the cloth was drawn (and later printed) an icon, and written details of the consecration of the cloth (especially the date and name of the consecrating bishop). A small pouch of Relics was sewn to its reverse side. It could be easily folded and hidden, and taken where it was needed. The use of these cloths pro-liferated because they could bÎ used on execrated, uncanonically con-secrated, and doubtfully consecrated altars. 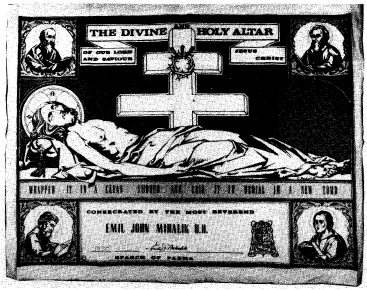 And this led to a new development-the use of antimensia on all altars; what was once pri-marily a portable altar (although it can still be used as such when neces-sary) now usurped the role of the corporal, the white linen cloth, or more commonly in the Eastern Churches, a colored (usually red) silk cloth about the size of a handkerchief, on which the vessels containing the elements of bread and wine are placed during the celebration of the Eucharist. 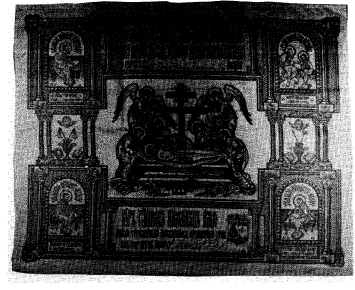 In many cases, then, two altars are superimposed, that is, a portable altar rests on a fixed altar. 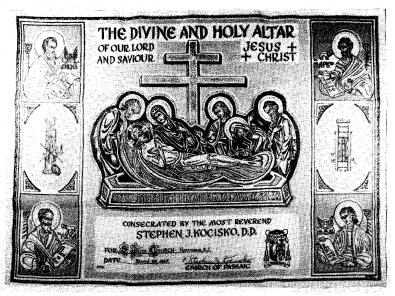 In modern usage, all of the Eastern Orthodox and most of the Byzantine Catholic churches use the antimensium even on a fixed consecrated altar. 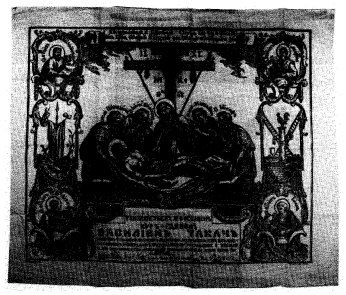 It is kept folded within a slightly larger piece of colored (usually red) silk called the eileton (Slavonic iliton), when not in use, and rests on the front of the altar underneath the Gospel Book. When the time comes for it to be unfolded and spread out, just before the Great Entrance until just after Communion, it lies on the eileton. Some liturgists feel that the eileton is properly the corporal and should just lie upon the antimensium, instead of under it, but this is not the standard practice. The Ruthenian-Ukrainians, following the Synod of Zamosc (1720 A.D.), keep the antimensium spread out under the top altar cloth, and use a corporal on top of the altar in place of the eileton (and anti-mensium). Thus they treat the antimensium as if it were a Latin petra sacra. The purpose of this change as stated by the Synod was: “cleanliness and comeliness” (munditia and decentia). It is also alleged that this practice preserves antimensia from wearing out too rapidly as a result of daily folding and unfolding. The antimensium is a very real symbol of the bishop’s presence as the archpastor of the whole eparchy (diocese) because it may be consecrated only bÑ a bishop. In so doing, he sprinkles it with Rose Water, anoints it with Sacred Myron (Chrism) and places Relics of the Martyr Saint in the tiny pouch affixed to its reverse side. 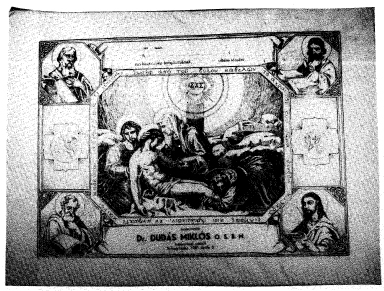 Finally, he signs the bottom of the obverse of the antimensium, entering in the details of its consecration, especially the date, his title, and often the church for which it is destined, and sometimes seals it with his own seal. There is a controversy as to whether or not an antimensium should be washed or repaired once it has become too soiled or worn to be decently used. Washing might damage the Relics and would also probably remove the Holy Myron with which it has been consecrated. For these reasons, it seems appropriate to send an antimensium that is no longer usable to the bishop’s chancery, where it may be kept with due reverence in the bishop’s chapel, usually under an altar. 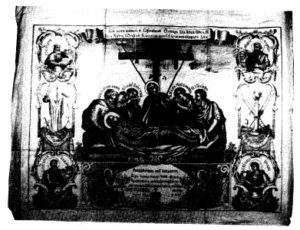 However, due to the vicissitudes of ecclesiastical as well as political life in Eastern Europe, many antimensia have found their way into museums and other collections. Antimensia can be very important historical documents. Although they were intended exclusively for liturgical use, the fact that they carry the details of their consecration makes them a witness to history. If we lack other documentation regarding a hierarch, an antimensium consecrated and signed by him would establish that he exercised his jurisdiction in a certain place at a certain time. Furthermore, examination of the antimensia in regard to their material, ornamentation, and inscriptions often reveals important information regarding the history of eparchies (dioceses) and their frontiers and place names; ecclesiastical art, ecclesiastical and secular architecture (some city towers and walls, now in ruins, have been found depicted on antimensia); paleography and philology; the state of the art of textiles at a particular time and place; and liturgical usages. The Episcopal and Heritage Institute Libraries of the Byzantine Catholic Diocese of Passaic, created by the Most Reverend Michael J. Dudick, hold several dozen antimensia, to which this present catalogue is a monument. Bishop Dudick’s collection is virtually unique and very distinguished. 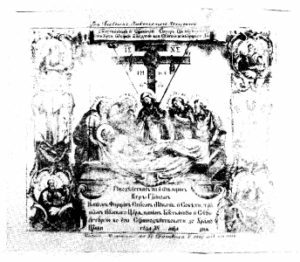 This EHI catalogue, one of the few publications devoted to antimensia, is a vital contribution to ecclesiastical and secular his-torical scholarship. We must never lose sight of the fact that even though for the scholar the antimensium is an important historical document it has a different meaning for others. In the Byzantine ethos and in Byzantine spiritu-ality, it remains above all a sacred object, taking the place of the fixed altar, and indeed being the substitute for the whole church, the entire sanctified building of liturgical worship. 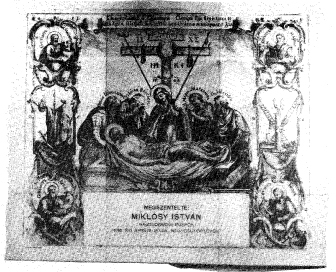 When a priest is given an antimensium by his bishop, it is equivalent to what is called in the Western Church a celebret, that is, a document testifying that he is canonically ordained and in good standing; however, the Byzantine antimensium is much more than this because since it symbolizes the presence of the bishop (who consecrated it) at each Eucharistic Synaxis, it also symbolizes the fact that the priest shares with the bishop in the Apostolic Succession and communion with the One, Holy, Catholic, and Apostolic Church of Christ. The antimension recalls the time when Christians were persecuted and the Church had no settled abode. They could not carry an altar from place to place, so they used a Communion cloth into which Relics of the Saints were sewn. To us in our day the antimensia proclaims that the Church is not confined to any exclusive building, city or locality, but rides like a ship on the waves of this world, nowhere coming to anchor, for her anchor is cast in heaven. 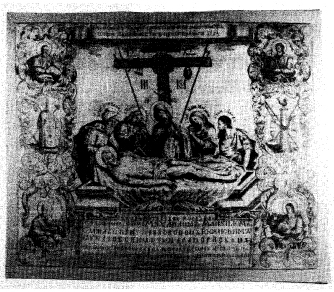 Januarius M. Izzo, O.F.M., M.A., J.C.D. 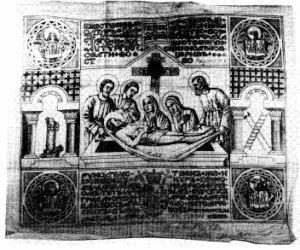 The antimensia described on the following pages are part of a collection of religious and folkloric objects in the Episcopal and Heritage Institute Libraries of the Byzantine Catholic Diocese of Passaic, N.J., one of the largest collections of its kind in the United States. The collection includes the antimensia of half the bishops who reigned in Subcarpöthian Ruthenia and antimensia from all the Byzantine-Ruthenian bishops in the United States. What is missing could only be filled with items held by other repositories (for example, in 1908 the Church Museum at L’viv-Lemberg in Galicia, now the State Museum of Ukrainian Art, had antimensia from two bishops of PresÓv [Prjasiv] not represented in the EHI collection – J. Gaganec’, 1843-1875, and N. Tovt, 1876-1882 [Svjanc. No. 74, 75] ). One antimensium, older than any others in the EHI collection, from Bishop B. Tarasovyc in 1648, is known through an inscription preserved in a Latin translation of 1725 (Hod., p. 155). The material in this catalogue illustrates first the antimensia of the bishops of the Byzantine-Ruthenian eparchies in Eastern Europe and then the antimensia of the bishops of the Byzantine-Ruthenian emigration. Within these two categories, the antimensia are further subdivided into five groups, three in the first category and two in the second. In the first group are the antimensia of the bishops of Mukaclevo (reigned 1716-1924); in the second the antimensia of the bishops of Presov (reigned 1818-1960); in the third the antimensia of the bishops of Hajdudorog (reigned 1913-1972); in the fourth the antimensia of the bishops of Krizevci in Yugoslavia (reigned 1914-1940); and in the fifth the antimensia of the bishops in the United States of America (reigned 1907-). 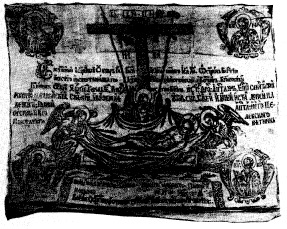 The entry for each antimensium contains the following information: name and dates of bishop; physical description; year of consecration; designer and printer (if known); basic text with translation; and reference to parallels. Because there is a photograph of each antimensium, texts printed on the antimensia in English are not transcribed. In their technique and motives the Byzantine-Ruthenian antimensia represent a late stage in the development of this element of the Christian liturgy. They are printed rather than hand-painted as was the practice until the seventeenth century. They are characterized by figu-rative images rather than bÑ simple symbols as was the earlier practice (a similar shift from symbols to the scene of deposition of Christ’s Body occurred between the 16th and 17th centuries in Greek antimensia, Theoch. No. 1-4). 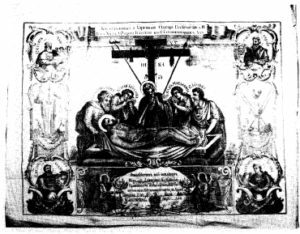 The EHI antimensia all display themes like the Good Friday epitaphion (plascanycja); their common motive is the deposition of Christ’s Body. And the most recent ones demonstrate certain Western influences – for example, bishops’ crests, an innovation shared bÑ Ukrainian-Ruthenians and Egyptian-Melkites (Izzo, p. 42). For economic reasons, the same design was often used by a succession of bishops (which may even cause anachronisms, for example, in Bishop Gebej’s antimensium of 1926 with the titles applicable to Transcarpathian bishops until 1918 only, when they were “Privy Counselors of the Apostolic King” of Hungary). 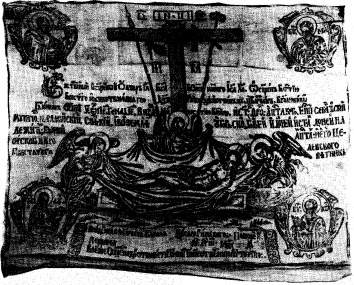 The names of Byzantine-Ruthenian bishops may appear in Ruthenian, Hungarian, or English on their antimensia. We have given priority to the Ruthenian version of surnames except for the names of bishops born in thÎ United States, which are given in English only. For the transliteration of Ruthenian Slavonic we have used a simplified version of the system described in Recenzija: a Review of Soviet Ukrainian Scholarly Publications (Cambridge, Mass. : Ukrainian Research Institute, Harvard University). For suggestions and assistance we are indebted to Roger E. Stoddard and the staff of the Houghton Library, Harvard University; the Very Reverend Dr. Athanasius Pekar, O.S.B.M., Rome; the Very Reverend Dr. Basil Shereghy, Pittsburgh, Penn. ; Oksana Horodyska-Grabowicz, University of Massachusetts, Amherst; the Reverend Dr. Alexander Baran, University of Manitoba, Winnipeg; and Professor Omeljan Pritsak and staff of the Ukrainian Research Institute, Harvard University. 1. 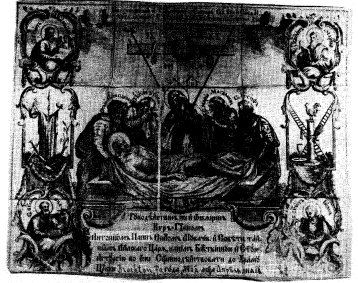 ANTIMENSIUM OF BISHOP GEORGE GENNADIUS BIZANCIJ OR VIZANTIJ (r. 1716-1733). Black ink on fine linen. 41.2 ∑ 33.8 cm. Redesigned on the basis of the M.V.L. 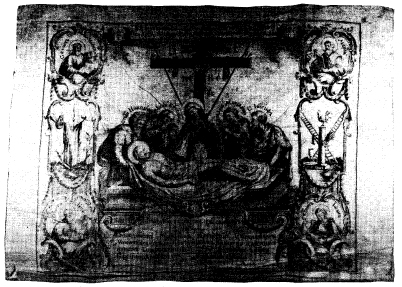 design for the antimensium of the Bishop of L’viv, J. Sumljans’kyj, 1667. Black ink on linen. 38.7 _ 31.8 cm. Black ink on white linen. 38.9 ∑ 31.8 cm. Black ink on white cotton. 50.4 ∑ 36.7 cm. Designed by I. Mansfeld in Vienna, 1773 (according to Svjanc. no. 74,-1775 but our reading seems to correspond better to historical dates). Black ink on fine cotton. 36.5 x 42.7 cm. 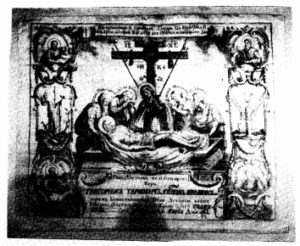 A copy of Mansfeld’s design (cf. no. 4) with changes in the formulary. Black ink on fine white cotton, pasted on paper. 44.8 x 37.5 cm. 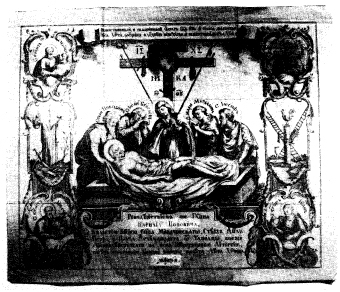 A copy of Mansfeld’s design (cf. no. 4 and 5) by A. Vobul’s’kyj, 1905, with changes in the formulary. Black ink on fine white cotton. 40.1 x 32.4 cm. The Mansfeld-Vobul’s’kyj design (cf. nos. 4, 5, 6). Black ink on white cotton. 43.6 x 35 cm. Black ink on fine cotton. 50.7 x 37.5 cm. Black ink on white cotton. 56.3 x 42.1 cm. Black ink on fine white cotton. 44.5 x 37.8 cm. The Mansfeld-Vobul’s’kyj design (cf. nos. 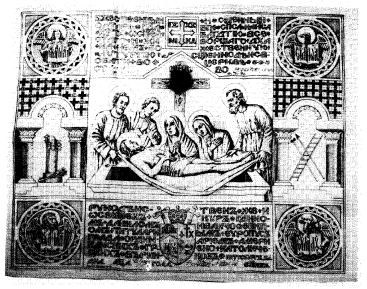 4, 5, 6, 7, 8) with the lower part replaced by a Hungarian text. Black ink on white cotton. 48.3 x 35.5 cm. Design by Pal Z. Szalay, 1926. Black ink on white cotton. 55.2 x 43.5 cm. Black ink on white cotton. 62.2 x 52.9 cm. Designed by George Makarevyc, 1901, printed by the monks of the Order of St. Basil the Great at Zovkva (Galicia), 1912. (Around the antimensium) (His form was ignoble and inferior to that of the children o f men (…) He bears our sins and is pained for us […] But he was wounded on account of our sins and was bruised because of our inequities; the chastisement of our peace was upon him and by his bruise we healed. [Isaiah 53: 3-5 Septuagint]). Black ink on fine cotton. 44.2 ∑ 38.1 cm. The Mansfeld-Vobul’s’kyj design as in nos. 4, 5, 6, 7, 8 and 11. Black ink on fine white cotton. 45 ∑ 37.5 cm. The Mansfeld-Vobul’s’kyj design as in nos. 4, 5, 6, 7, 8, 11, 15. Black ink on white linen. 44.1 ∑ 35 cm. No inventory or ledger number provided. Black ink on cotton. 42.8 x 33.8 cm. Designed by Alexis Szabo, 1948. Black ink on fine white cotton. 44.9 x 36.9 cm. The same antimensium as no. 18 (designed by A. Szabo) signed by Bishop Ivanco in 1954 and by Bishop Elko in 1955. Gray and red ink on white linen. 45.7 x 36.8 cm. Brown, beige yellow and blue ink on white linen. Crimson silk lining. 51.6 x 37.8 _m. 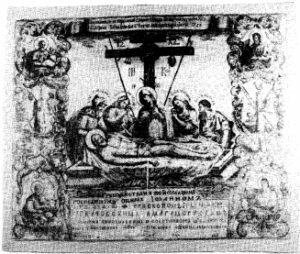 The Church Slavonic part of the text: (And wrapped him in the linen and laid him in a sepulchre. Gospel by Mark, Incipit 9 [Mark 15:46]). Brown, yellow and red ink on white linen. Red silk lining. 51.9 x 39.2 cm. The quotation is from Matthew 27:59-60. Brown, teal-aquamarine and mustard ink on white linen. Designed by Christine Dochwat, 1969. The same quotation as in no. 22. Hod. — Ántal (Antonij) Hodinka, A munkácsi görök szertart. Püspökség okmánytára, vol. 1 (Uzhorod, 1911). Izzo — Januarius M. Izzo, The Antimension in the Liturgical and Canonical Tradition of the Byzantine and Latin Churches: An Inter-ritual, Inter-confessional Study (Rome, 1975). Lad. — V. Ladyzyns’kyj, “Ukrajins’ki antyminsy XVII-XIX st.,” Notatky z mystectva (Philadelphia, 1976), no. 16. 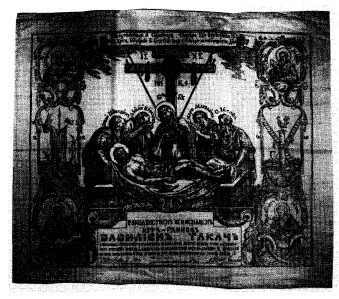 Svjenc.— Ilarion Svjencic’kyj, Kataloh knyh cerkovnoslov’ jans’-koji pecati (Zovkva, 1908). Theoch. — Maria Qeocarhs, Antmhnsia ek tou speuofulakiou ths monhs tou Swa (Athens, 1972), offprint from Panhgurikos tomos epi th 1400 amfiethridi ths ieras monhs tou Swa (Athens, 1972). This Catalog, compiled by Edward Kasinec and Bohdan Struminsky, with an introduction by the Right Reverend Mitred Archimandrite Januarius M. Izzo, O.F.M., M.A., J.C.D., is the second in a series being sponsored by the Episcopal and Heritage Institute Libraries, Future publications will include descriptions of the holdings of Byzantine-Ruthenian episcopal vestments and religious accessories as well as icons and Ruthenian art. The Most Reverend Michael J. Dudick, D. D.